I am someone who loves when we get more daylight thanks to daylight savings time. Perhaps I’m more of a spring/summer person. Perhaps I have seasonal affective disorder. Perhaps I just like using the word “perhaps.” Perhaps. I pride myself on having the original Tivo. It’s so old that I have to turn in on the same way that I start a lawnmower. My Tivo knows me well and I know my Tivo well. It records the shows I want. It even records the shows that I don’t even think I want, but then end up watching them and am glad that my Tivo looked out for me. I heart my Tivo so much that I have my Tivo co-sign my 401K and I’ve even added my Tivo to my will (it will be getting my TV and DVD Player). I have some sad news. 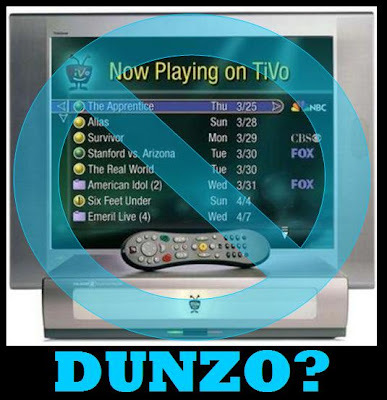 Daylight Savings Time made my Tivo sick. It has no clue how to react to the time changing 3-weeks earlier than normal. It shows the wrong time. The TV guide on my Tivo is all jacked up. To make things worse, the crap that it has recorded for me makes me feel that my Tivo doesn’t know me at all any more. It literally recorded “Sabado Gigante” on the Spanish channel and it also recorded some religious show with this nun who wears an eye patch. No joke. Ok, so I fast-forwarded through the nun with the eye patch because I thought it was a skit, but then when I realized it wasn’t I was just pissed at my Tivo. I then realized that it wasn’t my Tivo’s fault. My Tivo was sick. I thought I heard it sneeze at one point. I, of course, called 911 and even used the paddles to try and bring my Tivo back to life, but no luck. I brought my Tivo to church to get it blessed by a priest, but there was a line that was too long with others getting their Tivo’s blessed as well. This is a sad time for me, really. Similar to September 11th and the OJ chase, I’ll always remember where I was when my Tivo got sick and stopped knowing me. Sad. Sad. I have called the priest to perform the sacrament of “last rights” on my Tivo. I can only pray for a recording miracle sometime in the near future. Hold me.